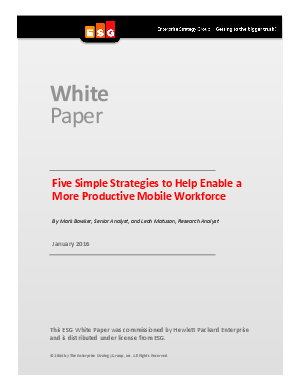 Discover five simple strategies to help enable a more productive workforce in this analyst white paper from ESG. Productivity — it’s the vital ingredient of a nimble business. When IT is simple to manage and robust enough to take on heavy workloads, the door to innovation opens. When teams can collaborate anywhere, anytime, they can pounce on emerging opportunities. HPE Just Right IT delivers the power of productivity to your organization — at your price point.